There are various Carnival traditional recipes, especially for sweets. 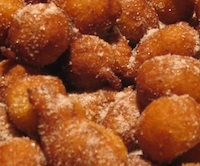 The most typical are the Chiacchere, also know as Galani, Crostoli, Frappe or Bugie. You can find the recipe here. This year, we decided to present a recipe for Fritole, the typical Venitian Carnival sweet. Fried dough with candied fruit, raisins and pine nuts: "il successo è garantito!" Oil for frying (possibly extra virgin olive oil). Cover with a tea towel or film and let it rest in a warm place until it has doubled in size. Fry the fritole throwing a generous spoonful of dough into hot sizzling oil. Dry on paper towels, sprinkle with icing sugar and serve warm.